"Our Naked palette revolutionized neutrals forever and went on to become one of the best-selling palettes ever! When fans demanded more, Naked 2 delivered. Even now, three years after the frenzy first began, the requests for “MORE Naked palettes!” keep coming. Finally, the wait is over. 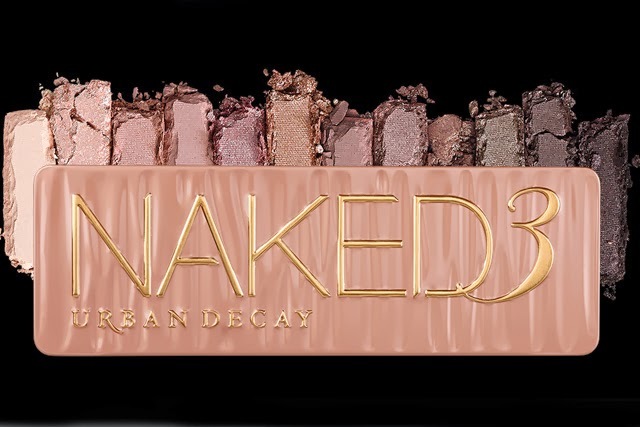 Urban Decay launches Naked 3, featuring 12 TOTALLY NEW rose-hued neutrals. Our previous Naked palettes have always included new shades, but this is the first time we've done a Naked palette with 12 never-before-seen shades that aren't available anywhere else. Choose from every finish imaginable: ultra-smooth mattes, gorgeous pearls and glimmering metallics. From the palest, shimmery pink to deep, warm black, these neutrals will make you want to get Naked all over again. Naked 3 comes in an art-school-inspired tin case (reminiscent of the Naked 2 palette), in a gorgeous rose-gold colour tin that hints at the shades inside. Embossed on top with a big “Naked 3” and cool facets that beg to be touched, this case is sure to inspire lots of jealous stares. Each Eyeshadow features our Pigment Infusion System™, the proprietary blend of ingredients that gives every shade its velvety texture, rich color, serious staying power and blendability. Naked 3 also includes a NEW double-ended Good Karma Shadow and Blending Brush AND an Eyeshadow Primer Potion sampler with resealable samples of all four formulas (original, Sin, Eden and NEW anti-ageing). Each sample holds about a week’s worth of primer!" Christmas Giveaway, Which Product You Want?